This more than Moore technology is still ramping up, and problems need to be solved, but it could lead to some fundamental changes. Long-haul communications and data centers are huge buyers of photonics components, and that is leading to rapid advances in the technology and opening new markets and opportunities. 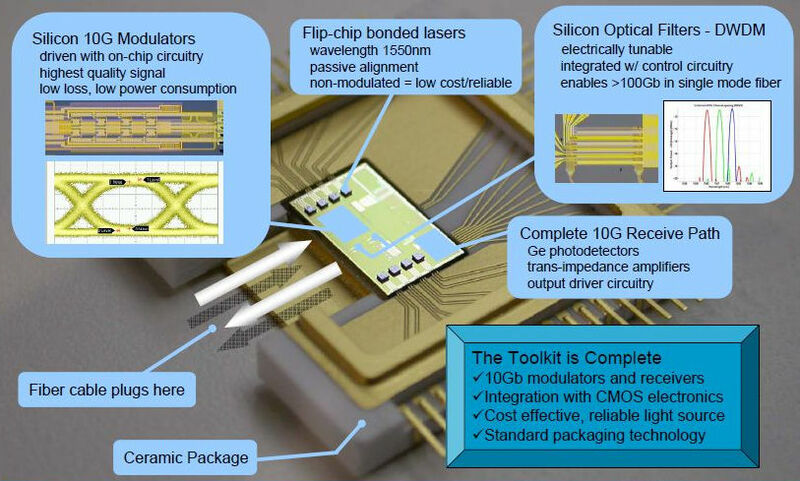 The industry has to adapt to meet the demands being placed on it and solve the bottlenecks in the design, development and fabrication of integrated silicon photonics. But it is not just about bandwidth anymore. Integrated silicon photonics has the ability to fundamentally change some notions of computing. The industry is just beginning to see what may be possible. In photonics there are two typical approaches to integration. The first uses hybrid dies, which have photonics elements directly on the CMOS die so CMOS transistors are on the same substrate as the photonic elements. This is the approach taken by Luxtera. However, most people still do a multi-chip design, which has a photonics die and an electrical CMOS die. Several foundries have announced PDKs this year. Then you can go one stage up in abstraction. Matrix multiply is the performance limiter in machine learning and consumes a large amount of power. With an optical equivalent it can be performed much faster and with a tiny amount of power. The world of integrated silicon photonics is getting a lot closer and the necessary tools and flows are coming into place. Soon it will be up to the industry to come up with the most innovative ways to utilize it. Experts at the Table, part 3: What is the role of EDA in building photonics systems, is a viable IP market developing and how are photonics systems tested? Experts at the Table, part 2: What can be done to reduce costs and improve packaging options, and what makes sense in terms of fabrication technologies.